It may not seem possible, but a cheap bathroom remodel is absolutely attainable. Popular home remodeling culture makes it appear that all bathroom remodels must cost five figures and that everything must be ripped away and replaced. But resisting that notion is the first step to deflating spiraling bathroom remodel costs and bringing everything back down to earth. Bathroom remodeling, along with kitchen remodeling, takes its toll on homeowners in terms of misery, unmet timetables, and high costs. Given the staggeringly high cost of bathroom remodeling, it pays to think outside the box and search for smarter and more economical alternatives. After a low-cost and lean bathroom remodel, not only will you have a clean, bright, and functional bathroom, you will have considerably more money in your bank account than homeowners who went the more expensive, wasteful route. Retaining and refurbishing your existing materials is always the best option for saving money. But if you must swap out materials, inexpensive alternatives often can look amazingly like the real thing. For example, instead of real wood plank flooring, try luxury vinyl flooring. Today's vinyl flooring looks far better than earlier iterations. Innovations such as luxury vinyl flooring and plank vinyl can even fool the eye from a distance. High-definition laminate countertops and quartz countertops now vie with granite for the look of authentic natural stone. Faux-stone ceramic and porcelain tile backsplashes can mimic the look of travertine and marble. If your bathroom happens to have a wooden floor, you can rip it out and replace it with a more moisture-hardy flooring, such as tile or engineered wood flooring. Or save time, energy, money, and the environment by keeping your wooden floor and painting it with a protective enamel. Keep in mind, though, that solid hardwood should not be your first choice for bathroom flooring. But if you already do have wooden floors, this is one low-cost way to keep them around for as long as possible. Consider total replacement of your bathtub to be your last possible option, at least from a cost savings standpoint. Instead, try relining or refinishing. Bathtub and shower refinishing is a prime example of the dictum "Repair and retain rather than remove." If the problem is mainly cosmetic, such as a yellowed surface and some cracks and nicks, you can refinish your shower or bathtub. Alternatively, bathtub and shower liners, never a permanent fix, are not as cheap as they seem. Requiring professional installation, liners will carry you through a few years. Bathtub refinishing, instead, is cheaper and looks better. One step down from refinishing the entire tub surface is a tub touch-up. When your bathtub has nicks, gouges, and peeling paint, but you are not keen on the idea of refinishing the entire surface, you can spot-fix the tub. Some touch-up products, such as Super Glue White Porcelain Repair, are as easy to apply as squeezing toothpaste out of a tube. Buying and installing new bathroom cabinets can get expensive. A far easier and cheaper way to bring life to your existing cabinets is to strip out the old hardware and replace it with fun new hardware. To make the process even easier, before you buy the new hardware, make sure that its screw alignment matches up with the holes on your existing cabinets. This eliminates the need to drill new holes. As with installing new hardware on cabinets, installing a new sink faucet is one trick designers and do-it-yourselfers alike use to make a sink sparkle without replacing the entire top or vanity. Pre-fabricated shower units generally are cheaper than tiled showers. The most expensive option is hiring tradesmen to build a unit out of tile from scratch. While site-built tile showers and tubs can be gorgeous and unique, consider a pre-fabricated shower unit. If you absolutely must have that tiled shower, fusing a poly shower pan with the tile saves some hassle and some cost. Plumbers are worth their weight in gold. But if you have the strength to carry a toilet, avoid calling in a plumber to switch out the old toilet. Instead, install your toilet by yourself. Toilet installation involves very few waterline hookups. The hardest part of installing a toilet is physically moving the toilet into place. For that, buy an inexpensive hand truck or enlist the services of a friend. Interior painting can be accomplished by even the least skilled do-it-yourselfer. For whole-house painting, you may want to consider hiring a professional painter, due to the large scale. But consider how little painting you need to do in bathrooms. 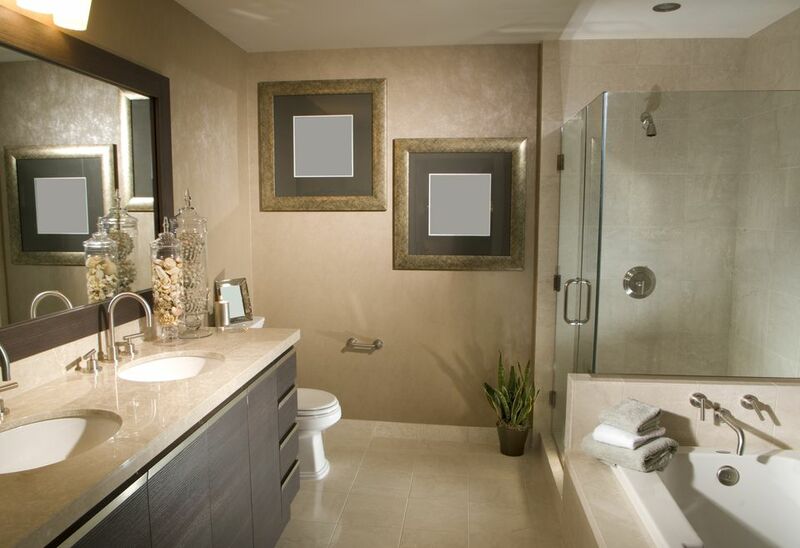 The majority of wall space is taken up with mirrors, showers, tile, and bathtubs. In the end, you only have a few square feet to paint. In many cases, you can paint this by yourself in a day or two. Save money by leaving the toilet and bathing facilities where they are. Do not move the plumbing when leaving everything in the same location will still satisfy your needs. Moving water supply and/or drainage immediately drives up the cost of any remodel project. If you hate calling upon the services of a plumber for remodeling work, stop for a minute and ask yourself if you possibly can do the plumbing by yourself. With the advent of plastic PEX plumbing pipes and push-fit Sharkbite brand fittings, even the least confident do-it-yourself plumber can do light plumbing tasks with relative ease. If your notion of plumbing work is still rooted in the days of soldering copper pipes with an open flame or working with galvanized pipes, give this idea some serious thought. You just might find out that PEX and push-in fittings are perfect for your needs. Bathroom vanities and tops practically come assembled for you. Because bathrooms are small, it is possible for you to buy nearly or fully assembled bathroom vanity units and vanity tops and have them in place within a couple of hours. Vanity units come in pre-determined sizes ranging from 24 inches to 60 inches wide. Coordinating counters can be purchased that even have sinks fused into them, eliminating sink installation and caulking woes. If you have two bathrooms and you remodel one of them, what should you do with all of those materials? Some homeowners have found that it is cost-effective to migrate materials from one bathroom to the other bathroom. Even materials as trivial as shower curtains, pipe, and picture frames can be moved to the next bathroom. While bathroom designers are great, they also can break your bathroom remodel budget. Consider designing your bathroom by yourself. Whole-house remodels, additions, and large kitchens can benefit from the expertise of a qualified designer. But what about bathrooms? If you need to save money it is possible to design your own. One factor in your favor is that you are not moving fixtures around. Bathroom designers are good at not just the pretty stuff but at powering through difficult logistical problems, such as puzzling out effective space design. If the bathroom material still works, fix it up and reuse it. This is the guiding principle of any surface-level renovation, with the caveat that you never want to cover anything because it needs to be replaced. For example, there is no better way to cover up the lower portion of walls than with easy-to-install wainscot. Wainscot is a pre-fabricated board that extends as high as 48 inches and eliminates the need to patch wall dings and minor holes; wainscot simply covers it up. But should that drywall be speckled with mold and mildew, the last thing you want to do is cover it up. Track down the source, clean it up, and replace affected portions of wallboard.